Sometimes you just want to get warm and make a statement. With the Frost Giant Cowl, you can achieve both. 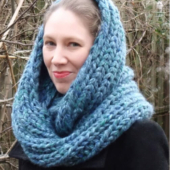 The cowl is worked flat and has two finishing options, choose the one you feel most comfortable with. The finishing options consist of either plain seaming or a three-needle-bind-off. 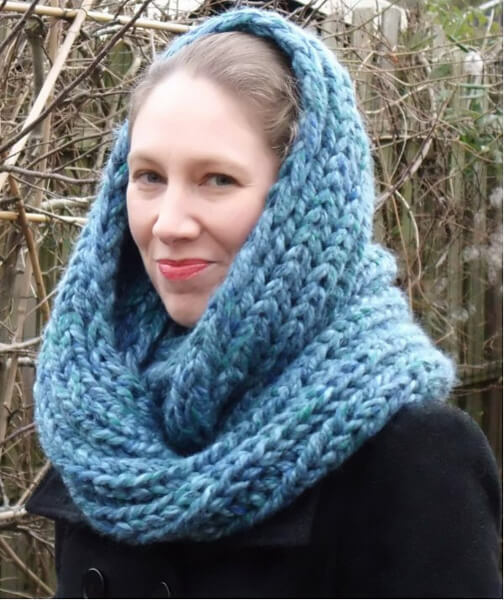 The sample cowl was knit using 270 m (297 yards) / 450 g Wibra Myrna [80% acrylic, 20% wool; 60 m (66 yds) per 100 g skein] held double. Substitute any (extra) bulky weight yarn for a similar result. Using a thinner yarn will result in a less humongous cowl. 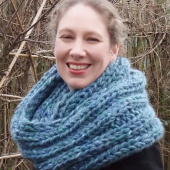 Adjust needle size appropriately when using a less bulky yarn for a smaller cowl. 5.5 sts / 8 rows = 10 cm (4 inches) measured over 2×2 rib. 27 cm (11 inch) wide (unstretched), 70 cm (27 ½ inch) long. 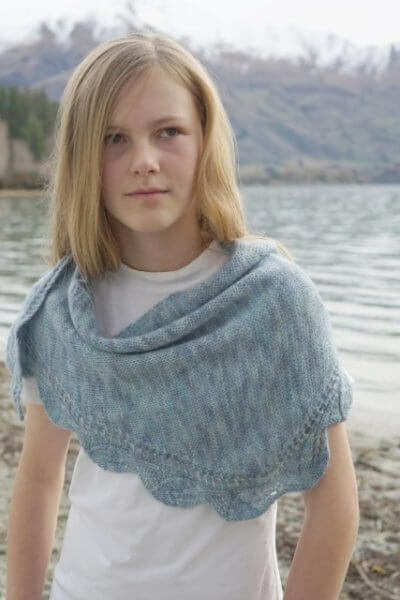 The plain seaming finishing option in this pattern is suitable for the beginning knitter. 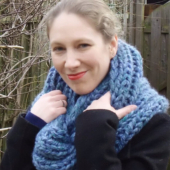 The three-needle bind-off finishing option requires a provisional cast on. Because this is a more advanced knitting technique, this version is suitable for the intermediate knitter. Stitches used include knit, purl and slipping stitches. Yarn is held double throughout. Always slip the first stitch of the row purl-wise with the yarn held to the back. When you run out of yarn, a new skein will be attached by knitting a few stitches with both the new and old yarn held double. The ends can be woven in later. CO 18 sts with the yarn held double. Row 1: Sl1wyib, k2, [p2, k2] 3 times, p3. CO 18 sts with waste yarn held double or triple. Row 1: Knit. Switch to working yarn held double. Row 2: K3, [p2, k2] 3 times, p3. Next: Sl1wyib, k2, [p2, k2] 3 times, p3. Rep this row until length of piece is 148 cm (58 inches) or desired length. BO using your BO of choice, for example, the knit bind-off. Next: Hold the ends of the piece together and use the yarn needle to sew both ends together and form a loop. Be careful not to twist the loop before seaming the ends together. Transfer the stitches from the waste yarn to the extra needle, be careful not to twist the loop when holding the beginning and end of the piece together. Step 1: Hold both needles holding sts next to each other. Step 2: With the third needle, knit each st through both the first st on the needle closest to you as well as through the first st on the back needle at the same time. Wrap as for a knit st and complete the stitch as usual. Step 3: Rep step 2 one time. Step 4: There are now 2 sts on your right hand needle. Lift the first st worked over the second st worked, using the tip of your left hand needle. Step 5: Rep steps 3-4 until all sts are BO. Click here for a tutorial on how to work a three-needle BO. Weave in ends and wear with attitude! Tip: Use a crochet hook to weave yarn ends in, when the yarn is to thick to use regular yarn needles. Just grab the yarn with the hook, pull it through the fabric and repeat. 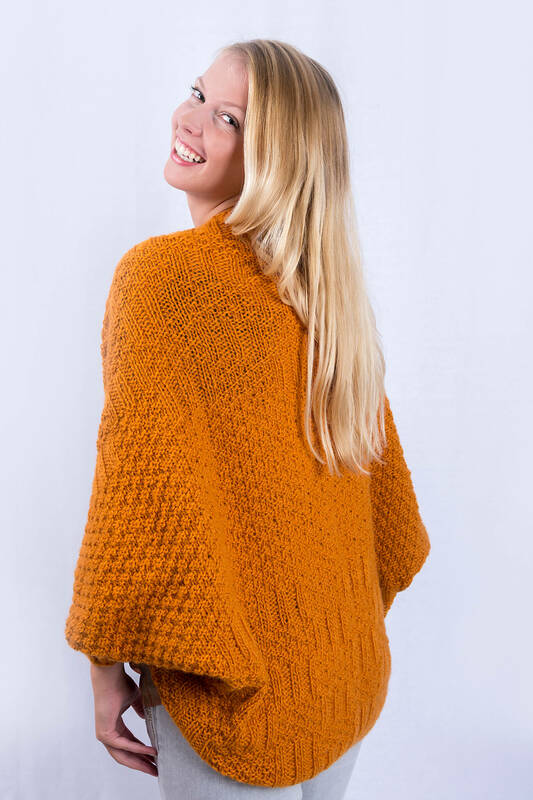 Click here to download the pattern for your convenience.